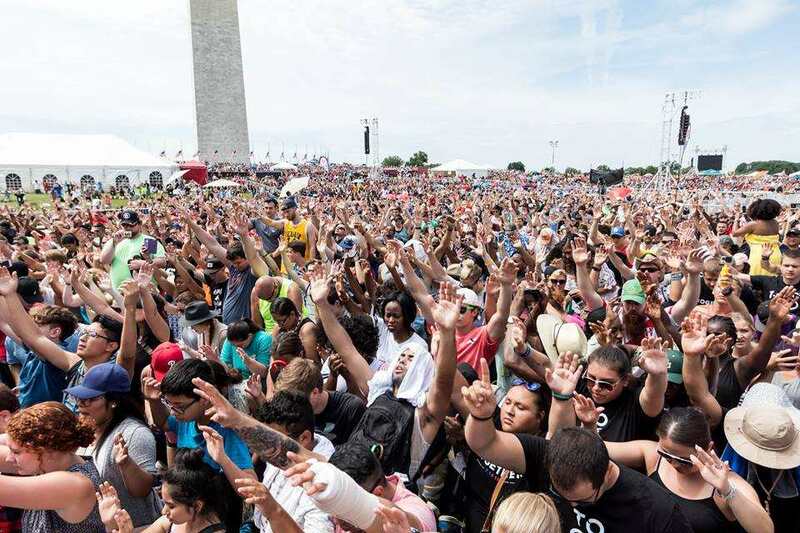 WASHINGTON — Thousands of youth flocked to the National Mall in Washington, D.C. on Saturday for the ecumenical gathering “Together 2016,” which sought to unite those of various backgrounds to “stand together for Jesus,” and had been preceded by an online endorsement from “Pope Francis,” the head of Roman Catholicism. The event featured speakers such as Francis Chan, Ravi Zacharias, Lou Engle, Christine Caine and Southern Baptist Convention President Ronnie Floyd, as well as music from Michael W. Smith, Hillsong United, Lecrae, Jeremy Camp, Lauren Daigle, Casting Crowns and Kirk Franklin, among others. Worship leader Matt Maher, who identifies as Roman Catholic, also told the outlet, “If we’re singing the same songs together, then we can’t yell at each other.” He has outlined at other ecumenical events that he believes it is his calling to work toward to the unification of Christians and Catholics. Lou Engle spoke of racial divides, referencing the cities of Minneapolis, Ferguson and Dallas. Francis Chan asked those gathered if after praying and worshiping together, attendees would be willing to be rejected for Christ together. Casting Crowns frontman Mark Hall told reporters that he thought the gathering was timely considering recent headlines. “[Our nation] is in a bit of a storm and a lot of people are hurting. It felt like everyone just came together and prayed it together,” he said. But some had expressed concern prior to the event as organizer Nick Hall (no relation to Mark Hall) had announced that Jorge Bergoglio, also known as Pope Francis, would be delivering a video message to those in attendance. A video endorsement from Bergoglio was posted and circulated online through the group’s social media channels ahead of the event, encouraging youth attendance. “I know there is something in your heart that moves you, and that makes you restless, because a young person who is not restless is an old person. And you have youthfulness and youthfulness breeds restlessness,” the Roman Catholic pontiff stated. Hall posted the endorsement on social media on June 21, which sparked much controversy. “Christians and false prophets will join hands and become one in this event. The great falling away is happening before our very eyes. We will not be silent!” another named Kenny commented. The event ended five hours earlier than expected due to the heat index, which resulted in a number of attendees suffering heat-related ailments. Editor’s Note: An earlier version of this story stated that a message from Bergoglio was played at Together 2016, which was previously promoted by the organization PULSE, led by Nick Hall, in a national press release: (see “Pope Francis to Address Americans at National Mall Event ‘Together 2016’ With Special Video Message.”) For unknown reasons, PULSE decided to circulate a video invitation/endorsement from Bergoglio via their social media channels rather than playing a video message at the event as the group initially announced.